ACM was established as the Millennium Project Group in 1998 by the Castleconnell Community Council (CCDC) and immediately set about the task of developing a Community Centre in the parish. The existing building at 14-15 Castle Street, Castleconnell was purchased in 2001. The building owner is ACM Community Development Society Limited which is a Community Owned Co-Operative Society (approximately 500 parish shareholders). The original founding members of the Millennium Project Group were John Mac Namara, Pat Dempsey, Lettie Sloane, Bob Critchley, Eddie Seery, Peggy Joyce, Tom Power & Nancy Holt.By the way, ACM stands for Ahane, Castleconnell and Montpelier! The local community owns the ACM Co-Operative Society which in turn owns & manages the Community Centre building. Each community shareholding member of ACM has one vote and a Management Committee is elected each year at the ACM Annual General Meeting. The Management Committee members work on a voluntary basis with principal officers retiring from their posts after no later than 3 consecutive years in such posts. The Community Centre provides the following facilities to the community – meeting rooms, community secretarial service, typing, photocopying and internet access. This service is available to all local community groups and private individuals. Other activities include day and evening classes, children’s santa party and the Castleconnell St. Patrick’s day parade. Back Row L/R: Majella Reidy (Asst Treasurer), Nancy Holt (Asst Secretary), Cora Moran (Secretary), Mary Golden (Treasurer), Pat Dempsey (Vice Chairman), Angela Dempsey (Festival Committee), Bernie Murnane (Festival Committee) and Catherine O’Doherty (Local Events Co-Ordinator). Front Row L/R: Dillie Edmonds, Ann Rylands, John Mac Namara (Chairman), Phylla Lynch (Local Events Co-Ordinator), Ena Walsh (Registrar) and Lettie Sloane. L/R – Cora Moran (Secretary), John Mac Namara (Chairman), Pat Dempsey (Vice Chairman), Emer Corbett (Treasurer), Lettie Sloane and Dillie Edmonds. 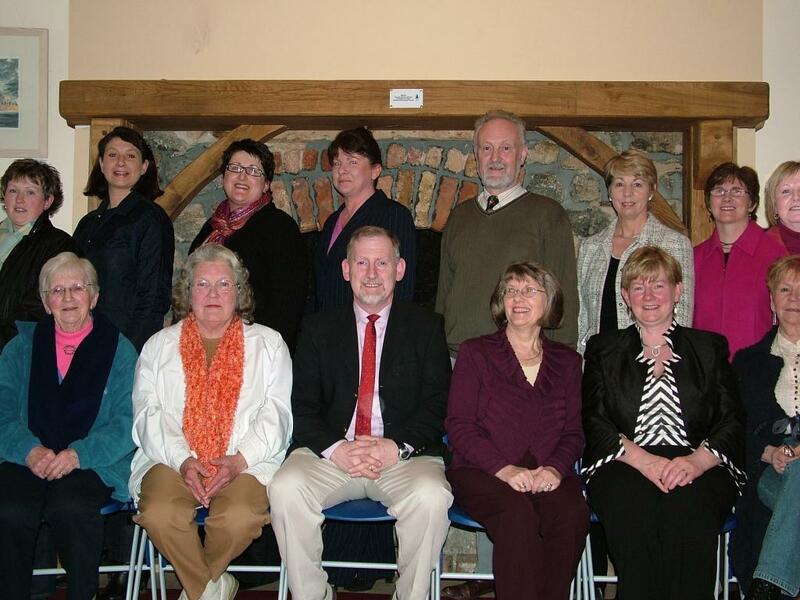 Breda Casey (Chairperson), Mary Kennedy (Vice Chairperson), John Mac Namara (Treasurer), Mick O’Brien (Secretary), Mary Golden (Assistant Treasurer), Chris Casey (Maintenance Officer), Bernie Murnane (Grants Officer), Phylla Lynch, Eamonn McQuade, Jennifer Caffrey and Shane Clifford.